We know that not everything can fit in the car when you go away which is why we have your cycling needs covered. 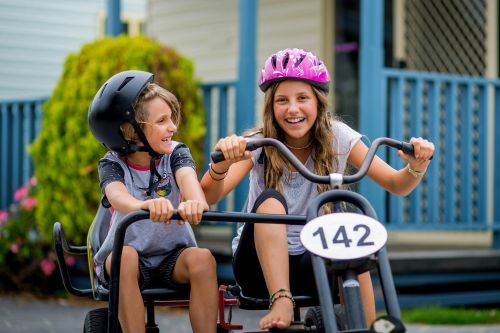 Whether it be our in park on the pedal go karts or our mountain bikes, we’ve got something to get your legs turning over. The mountain bikes can be hired half daily or for the whole day; helmets are supplied and we recommend riding along the Rail Trail. 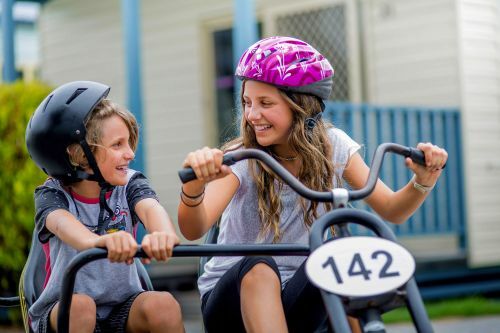 The rail trail, which spans some 30 plus kilometres goes from Port Fairy to Warrnambool and luckily for us, the start of it is only 400m from our park! 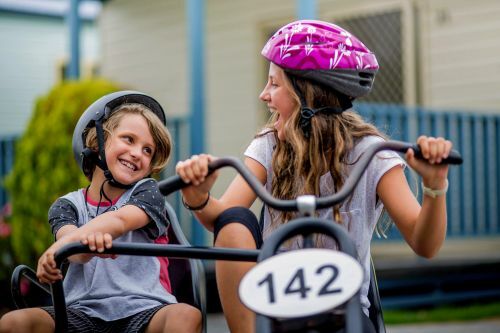 Throughout this scenic route, riders can take in views of picturesque Tower Hill (an extinct volcano), the old Koroit Rail Shed, lush farmland and many ocean views. We understand that not everyone can make that distance, but the great thing is because you are going at your own pace, you can turn around whenever it suits you. That way everyone in the family can be involved, whether its just a gentle family ride or a longer distance ride amongst friends. The rail trail provides plenty of opportunity for all types of cyclists. You could even just ride to Koroit (17km) for a coffee and meander your way home afterwards – the riding is flat. 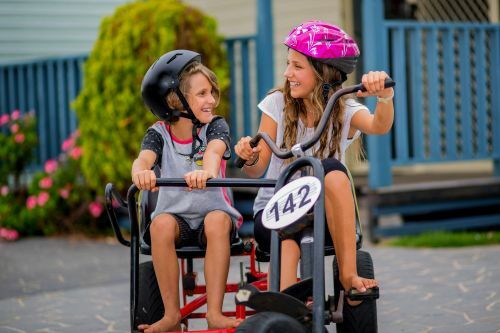 Or if cycling isn’t really your thing but you would still like to experience the great outdoors and get some exercise or would like something to occupy the kids to give you a break, then our in park go karts provide an alternate experience. Only available for use within the park, these single and double seated go karts will have you jetting around in no time. These can be hired for half an hour or hour blocks of time, and are a great way to encourage team work and sharing.